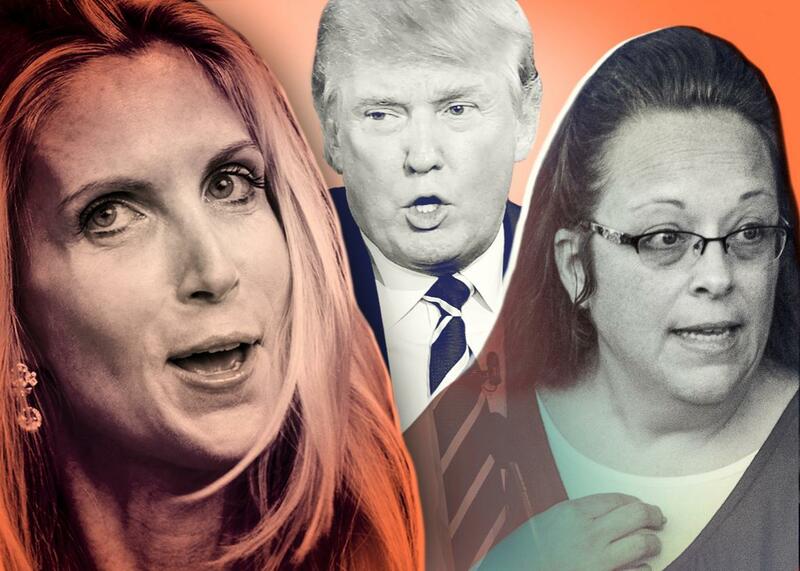 Media attention to Trump, Kim Davis, Ann Coulter: Should we ignore outrageous candidates? Unfortunately, that won’t make publicity-hungry, unserious, outrageous people go away. Don’t feed the trolls? Ann Coulter, Donald Trump, and Kim Davis. Photo illustration by Lisa Larson-Walker. Photos by Getty Images. More and more in recent weeks, I find myself having the exact same fight on social media: People want me to ignore newsmakers. “Stop posting about Kim Davis! You’re just encouraging her!” “Why are you writing about Donald Trump at all? He feeds on this!” The shark cat on the Roomba starts to look like the only permissible social commentary. Last month, after I wrote about misogyny and Donald Trump, I got a note from a progressive friend asking why I would possibly drive any more media attention toward a nonserious noncandidate who was simply feeding off all the news stories about his shocking behavior. A good point. And around that time, I suddenly had notes from several readers wondering why the media was elevating Kim Davis to a weeklong front-page story and why I was posting about her on Facebook. Her legal claims were unserious, and the sheep in the press were giving her precisely what she wanted: unending, slavish attention to a single holdout dissenter. Ignore her and she’ll go away, I was advised. We didn’t elevate every racist principal to a front-page media phenomenon post–Brown v. Board of Education. She does not have a real job, nor meaningful substance to anything she says. She is a professional troll who feeds on the attention she gets for her toxic words. She is like a moth who flies towards the light; she is not adding any light, just obscuring it, but somehow she becomes illuminated by it. And what do we do? We feed her more attention, we shed more light on her. Why? Don’t feed the trolls; they will die off. Turn off the light; or better, put up a screen. My objection was that if we—as consumers and producers and purveyors of news—decide that we will simply ignore the existence and arguments of every pundit, candidate, or religious dissenter to whom we object, it doesn’t in fact make them go away. It simply takes us out of the conversation. If I made it a policy to never post on Facebook or write articles about hugely popular public figures or movements simply because I don’t want to make them look more serious, or make their crazy worldview look legitimate, I would be elevating what we call “epistemic closure” to DEFCON 4. I could certainly write and think all day about issues I consider “serious”—the death penalty and voting rights and access to justice. I could also just post the Roomba Cat. And I could certainly live happily never again thinking about, or feeding, Donald Trump’s fatuous narcissism. But I am not sure I would be a smarter consumer or sharer of news, or a more thoughtful journalist, for declining to engage with public figures I don’t respect. To be sure, it’s not even fair to compare Coulter, Davis, and Trump. The first can rather easily be dismissed, and her racist followers are probably not going to change their minds. The second is a proxy for an important constitutional debate, and the latter is a front-runner for the GOP nomination. But the larger principle threading through all of this “ignore them” admonishment really worries me: that in a moment when capturing the news cycle is enough to make you a prominent national figure, the corrective is to shut off the news cycle, rather than engage in the debate. This is precisely why we have a liberal media and a conservative media that cannot agree on even demonstrable facts. Because ignoring the other side is a legitimate form of political discourse. Right or wrong, our current media are driven almost entirely by isolated umbrage explosions. Last week it was the Texas school that called the police on a Muslim kid for making a clock, and Carly Fiorina, who invented a memory of a Planned Parenthood sting tape and went uncorrected at the GOP debate. The second wave after the umbrage—the Fury 2.0—was that the Texas student was garnering all this grotesque liberal attention and Fiorina was soaring in the GOP polls. “Shut them off!” was the cry from both sides. Pretend it didn’t happen. This week it will be someone else. But the burgeoning response from both sides is: shut it down, don’t listen, don’t give them any more attention. That response is likely to engender a news media that is disengaged and polarized between my (serious) side and all the trivial people on the other side whose very existence I decline to recognize. Don’t misunderstand me: The high ground is an attractive place to want to live, and if I never have to think about the Coulters of the world again, I will not be impoverished in any way. But the aggregate effect of persisting in thinking that we are too sophisticated and intelligent to even acknowledge arguments and characters on the other side is always going to be even more isolation and vilification. And I can’t bring myself to believe that this will yield anything positive in the long run. Look: The media is absurd. It’s driven by extreme personalities and momentary outrage. The impulse to starve those personalities of their media oxygen is not wrongheaded. But those personalities and outrages are very real to half of this nation, and we need to engage and debate, even when they say hateful things, and not shame one another for feeding the trolls. So I am going to go ahead and write about people who may not seem real or serious or important. Because they speak to other people who are real and serious and important, and ignoring our way to a better discourse does not seem to be a recipe for meaningful political engagement; it’s its own form of solipsism, and we have quite enough of that already.